Dr Marais, the sole author, is the corresponding author. The management of patients with chronic orofacial pain is a challenge which faces the dental profession daily. These cases can easily be misdiagnosed, overtreated or undertreated. There is a very real danger also of classifying patients as suffering from a psychological condition when in fact they are suffering from organic disease. A series of cases illustrating these problems are presented in order to highlight the pitfalls and to suggest ways to overcome them. Diagnosis is central to all of these cases. Guidelines for the management of these patients are presented. In certain, relatively rare cases, pain can be a psychological aid which patients with mental disorders use to manage their personal problems.4 The existence of these cases also causes problems. The treating doctor can either categorize a patient with true organic disease in this category, or he might fail to recognize the patient as such and fall into the trap of unnecessary treatment. Chronic orofacial pain is a vague, general descriptive term which may include clinical entities such as trigeminal neuralgia, migraine, cluster headaches, neuropathic pains eg neuralgias, pain of the somatic structures and maxillary sinusitis. For the scope of this report its use will be limited to conditions other than these, which are difficult to diagnose, with or without apparent odontogenic causes. Figure 1. Multiple cracks visible. one at a time, and flushed, first with cold and then hot water. When this “specialised” form of vitality testing was performed on the second upper right molar, a most severe reaction was elicited. (Other vitality tests gave no positive results.) Several cracks in the enamel were also noted. 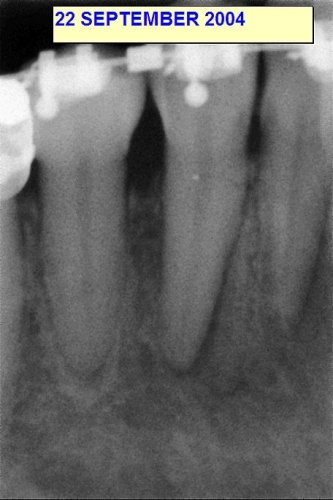 No abnormalities were seen on the radiograph (Figure 2). Figure 2 No abnormalities noted. Figure 3 Two years post-operatively. The patient, a 40 year old female, was referred by her orthodontist. She reported experiencing severe facial pain in the temporal region, and swelling of glands in the neck, each time the orthodontist adjusted the appliance. Clinical examination one day after orthodontic adjustment confirmed the presence of swollen, tender cervical lymph glands. Vitality testing was inconclusive but radiographically a peri-apical radiolucency of the 46 was noted (Figure 4). Figure 4. Note the slight thickening of the lamina dura peri-apically. Even though her pain was located in the temporal area, a decision was made to do a root canal treatment on the 46. Subsequently all symptoms and signs, including the swollen glands disappeared. This was confirmed at a 3 month recall (Figure 5). Figure 5 At three months post-operatively healing had taken place and all symptoms disappeared. 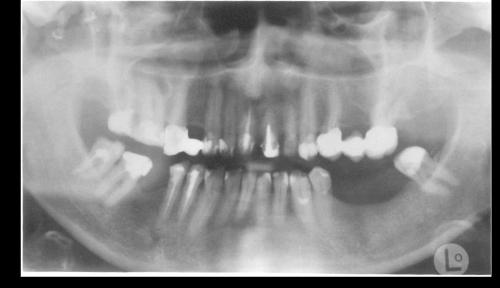 The patient, a 36 year old female underwent a course of fixed orthodontic treatment and orthognathic surgery and 8 years later developed severe orofacial pain, especially in the right maxilla. An abscess on the 12 was treated and the presence of widespread resorption was noted and more root canal treatments suggested. She then sought second and third opinions and eventually was referred to the endodontic practice. A careful, detailed, clinical examination was carried out with some teeth reacting to heat and cold testing: (21 heat; 22 cold; 24 cold; 35 cold; 32 and 31 heat; 41 heat and cold; 42 heat; 45 and 46 heat) The mucosa in the anterior maxillary area was notably red and swollen, particularly the areas of the surgical scars. Radiographically the presence of 3 “L” shaped fixation appliances and external root resorption on 15,14,13,12,11,21,22,23,24,25,31,32,33,34,35,41,42,43,44,45,46 were noted (Figure 6). Figure 6. 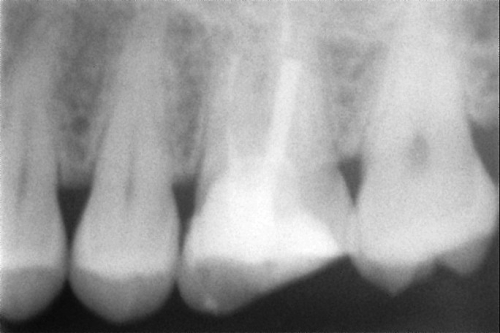 Note multiple resorption lesions. During the course of the next three years and fifteen consultations, the patient was continuously re-examined and root canal treatments on teeth 45,12 (re-treatment) and 13 carried out. The fixation appliance in the upper right maxilla was also surgically removed. Great care was taken not to over treat her and treatment was only carried out when the condition of the particular tooth had worsened, as judged by both patient and clinician. She continued to experience vague but severe symptoms. Over the observation period all resorption lesions had remained radiographically “stable”. The true nature of her condition (a definitive diagnosis) was still not clear when the patient relocated to a distant city and the patient was referred to another practitioner. 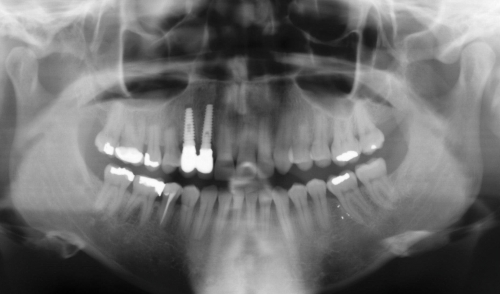 This practitioner opted to extract the 12 and 13 and placed implants (Figure 7). Figure 7. Taken five years after the previous radiograph. It can be seen that the resorption lesions had remained stable. This led to a disappearance of most of her symptoms. This practitioner reports that the resorption is slowly progressing but that the patient remains relatively pain free. A 30 year old female patient, who underwent orthodontic treatment at the age of 17 to 19, returned to the orthodontist, with a severe relapse. She had developed a complex malocclusion and seeked re-treatment. Her condition was also complicated by salivary gland obstruction and surgery as well as chronic gastritis, post hepatic biliary dysfunction and retrograde enterogastric bile reflux and subsequent abdominal surgery. The orthodontist commenced re-treatment and within months she developed a dull, vague orofacial pain and was eventually referred to the endodontic practice. After careful examination, diagnosis and consideration the root canal of the 46 was treated . At this time some widening of the periodontal ligament spaces of several teeth were noted, but because of the orthodontic forces it was considered that this appearance could not be accepted as diagnostic of endodontic disease(Figure 8). Figure 8. Note widening of periodontal ligament space. It was decided to only do root canal treatments when there was no alternative. As it turned out the patient returned complaining of severe pain, actually typing detailed reports of several pages of her pain. Over a period of several weeks root canal treatments were carried out on 46,45,43,42 and 36 (re-treatment of previous ineffective treatment). The endodontist was astounded to find not a single drop of blood or a shred of tissue in any of the canals. All the pulps were totally necrotic. She reported a dramatic improvement in her condition. In the meantime orthodontic treatment had been discontinued and this was now re-commenced. Six months later at a recall visit the patient expressed her concern about some lingering, vague pain which had returned . Figure 9 Six months post-operatively. No sign of pathology noted but patient was still experiencing some symptoms. Re-examination (Figure 9) failed to produce any conclusive evidence of disease and the patient was supported with advice and friendly words and she was invited to contact the endodontist at any time if severe pain returns. The 58 year old female was referred by a maxillofacial and oral surgeon for the treatment of acute toothache (16) and evaluation of the condition of 26,36 and 37. The surgeon was concerned about these three teeth because the patient had been suffering from severe pain on the lateral posterior border of the tongue adjacent to these teeth. He had biopsied this area, with no finding of malignancy. Eventually after many consultations and examinations, root canal treatments were carried out on 16, 26, 36 and 37 and these teeth restored with metal free crowns, but there was no real improvement in her pain. She was referred back to the surgeon and she underwent another biopsy. A diagnosis of squamous cell carcinoma in situ was made and resection carried out. The prognosis for this patient is questionable. The 29 year old female patient was referred for the treatment of severe toothache. The patient gave a medical history of an episode of “meningitis and encephalitis” and being in a coma for 3 months, some years previously. Since then she had been suffering from excruciating, severe headaches. Two root canal treatments had also been carried out without any improvement in her condition. In fact these teeth were hurting more than ever, she said. She had been advised to undergo psychiatric treatment. At examination it was found that she had a relatively small mouth, with restricted access. Nevertheless, over a period of more than a year, 17 appointments, examinations, prescriptions for analgesics, discussions and telephone calls, root canal treatments were carried out on teeth 26, 27, 36, 17 and the retained, deciduous 55. The 36 at one stage developed a white lesion on the gingiva, it was biopsied and found to be chronic inflammatory tissue. Despite all the best efforts eventually this tooth was removed and a fractured, stainless steel instrument found protruding through the apex Figure 10). Figure 10. Note fractured instrument. After removal of this tooth (36) patient experienced immediate relief of her chronic orofacial pain. She immediately experienced significant relief, also of her headaches. It is noteworthy that it took no less than 5 attempts to find and negotiate the second mesiobuccal (mesiopalatal) canal of the 26 to its terminus and the symptoms on this tooth only disappeared after this. The reasons for this protracted treatment lie in the peculiar difficulty of the case, i.e. 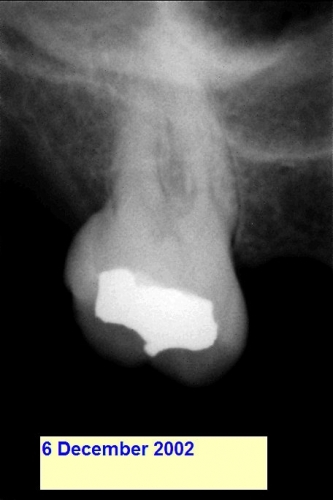 difficult access, small mouth opening, and extremely obscured and calcified canal. She is slowly recuperating, but still experiences occasional headaches. The patient, a 58 year old professor of biochemistry was referred after unsuccessful root canal treatment and apicectomy surgery on the 16 and 15 and subsequent extraction of the 16. 17 Root canal treatment, two attempts at re- treatment and apicectomy surgery and removal of cyst. 15 Root canal treatment, followed by extraction. Figure 11. First attempt at treatment, resulting in failure. Figure 12. Second attempt. Symptoms disappeared. The case was complicated by anxiety, bruxism, painful dry mouth predisposed by medication and she also received physiotherapy, psychiatric treatment, numerous medications and bite plate therapy. In the end the 15 and 16 were successfully replaced by implant supported crowns, all endodontically treated teeth restored and all pain disappeared. She was considered to have an extremely low tolerance for endodontic procedures resulting in several failures, re treatments, apicectomies and two extractions. 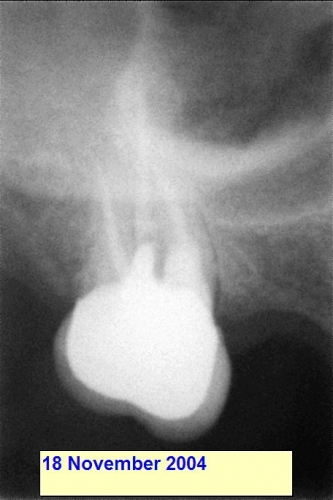 The most remarkable aspect of the case was however the state of the 36 and 37, which showed on radiographs very poorly performed earlier root canal treatment without peri radicular radiolucency, (Figures 13 and 14) without symptoms but with painfree, swollen, hard mobile lymph glands which were thoroughly investigated by several specialists and remained unchanged throughout the entire 3 year period. Figures 13 and 14. Despite very poor root canal treatments these two teeth had remained symptom free for more than a decade. Considering the history of the recent root canal treatments it was thought best to leave the 36 and 37 untouched, at this stage. The patient, female, was 69 years old at the time she was referred by a maxillofacial and oral surgeon. At this time the patient had received root canal treatment by her dentist on the 25 on no less than 10 occasions, over a period of 4 weeks. She arrived at the endodontic practice with a detailed, neatly type written account of her experience, something which she would do often over the course of the next two years. In these letters she often described her personal and health problems. Among other things she was most distressed by her daughter’s divorce, her retirement and the loss of her late husband. The referring maxillofacial and oral surgeon had prescribed a course of carbamazepine (Tegretol) as a diagnostic and therapeutic agent. Tegretol is an anti-epileptic with a known beneficial effect in the treatment of neuralgia. She reported an improvement in her pain condition when taking Tegretol. She was carefully examined and it was noted that she had four impacted molar teeth, the mandibular two in extremely close association to the inferior alveolar nerve and the maxillary with signs of cyst formation. 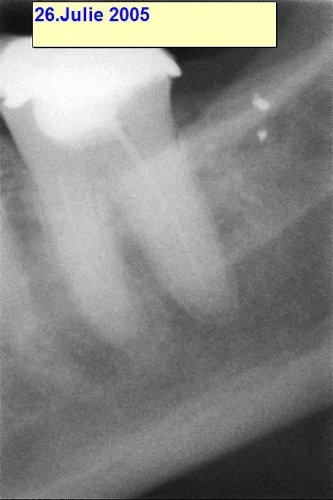 At first the root canal treatment on the 25 was completed and then the patient returned complaining of persistent pain. Over the course of six subsequent appointments the 23 and 24 were also treated with root canal treatment. 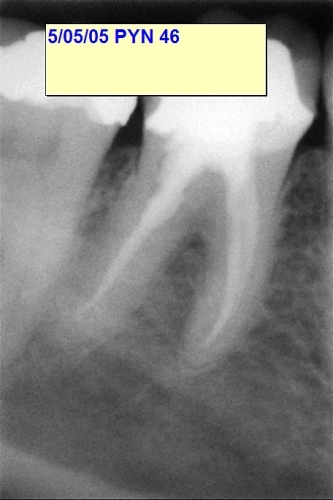 The endodontist deliberately resisted from filling any canal until the patient was able to confirm that she was pain free. This entailed several re-preparation and irrigation visits. Also, the two teeth were accessed at separate visits in order to judge whether the pain was associated with one or the other tooth and not to do unnecessary root canal treatments. At the obturation visit the patient stated that she was pain free but that the pain had now spread to the mental area. At this stage it was seriously considered that the reported pain might have had a significant psychological background. Her daughter, who lived more than a 1000 km away was contacted by telephone and the issue discussed with her. She concurred wholeheartedly and she said that her mother had experienced her recent emotional problems very badly. The daughter was of the opinion that her mother was exaggerating her pain complaints enormously, perhaps even faking it totally. Figure 15. 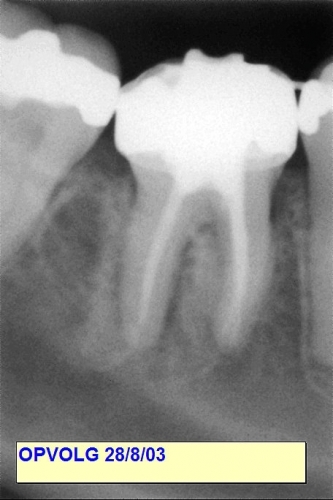 Note the four impacted third molar teeth and the root filled 23, 24 and 25. Throughout the entire period these four teeth had been a source of concern. However the patient’s age and medical condition (diabetes and asthma) totally contra-indicated surgical removal. The question remained – were these impacted teeth not perhaps responsible for some of her pain? Or was it all just a psychological problem? At each visit, of which there were many, the patients complaints were listened to, patiently, and her mouth was thoroughly examined for any sign of disease. Her description of the pain was always vague. Never did she indicate any specific area and seldom was there any consistency in her description of the locality, duration and nature of the pain. Eventually she developed some severe pain in the 24, and a 9mm pocket was discovered on this tooth and the tooth was removed. Slowly over a period of a year the patient’s visits became less regular and at two subsequent visits she claimed that she is now totally pain free. She also mentioned that her daughter had returned, at the same time that her pain had disappeared. She continues taking 200 mg Tegretol per day. The patient was involved in a car accident in her native Poland in 1994. At the accident scene she was thought to have died but later signs of life was observed. She had suffered major trauma to her face and subsequently lost her eye. Over a period of five years she suffered severe orofacial pain until in 1999 eleven root canals were treated. All her pain dramatically disappeared and she remains pain free, at the time of writing . Figure 18. 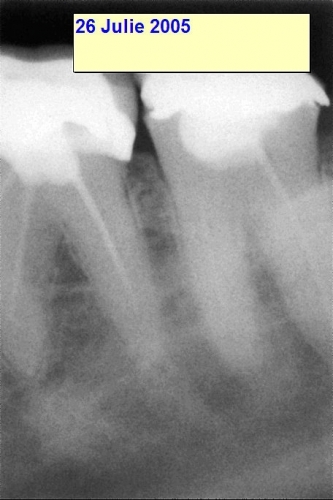 Although the 26 exhibited clear evidence of inadequate root canal treatment it was not considered to contribute to the patient’s pain. Figure 19. The 37 was recently restored with the restoration in close proximity to the pulp. 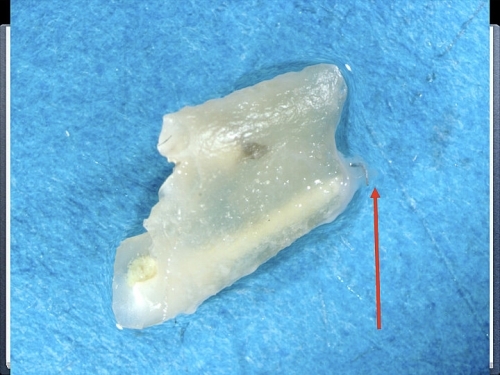 Extraction of this tooth alleviated all the patient’s symptoms. After due consideration a diagnosis of irreversible pulpitis of the 37 was made and the patient opted, for financial reasons, to have the tooth removed. After extraction all her symptoms disappeared immediately and permanently. The management of patients with chronic orofacial pain is a challenge. It is very easy to fall into the traps of over or under treatment. It is easy to judge patients as being neurotic or hysterical, because the odd cases do in fact exist (Case no 8 perhaps). It is also quite possible to do “unnecessary” root canal treatments (Case no 5 perhaps). On the other hand doing a “simple” root canal treatment can and has saved patients from extremely complex procedures such as orthodontic treatment and orthognathic surgery (Case no 1, definitely). Also, these specialised forms of treatments can in fact be the cause, not the cure of chronic facial pain, when resorption develops. (Cases no 2, 3 and 4 definitely). Case 3 is an extreme example of apical external inflammatory root resorption following orthodontic treatment and orthognathic surgery. This was complicated by the patient’s personal experience of pain which was characterised by a number of “abnormal” complaints or statements, ranging from “pressure on both sides of the face”, “an itching sensation”, “something moving inside the tooth” to “an almost enjoyable sensation”. Clearly, these comments were not typical of patients suffering from an endodontic disease process, but then again the extent of her resorptive lesions was extraordinary. 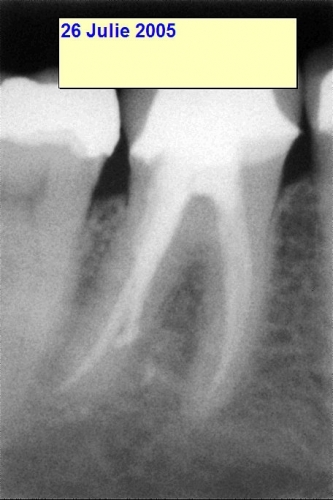 The big danger is recurrence of external inflammatory root resorption after root canal treatment. Perhaps this is what happened in Case 3, leading to the extraction and implants. 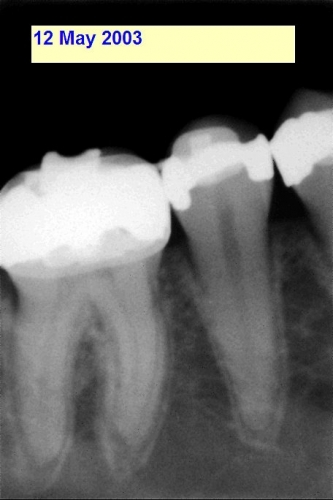 The question remains, how should the rest of this patient’s resorption lesions be treated? To embark on either a course of extensive endodontic treatment, or removal of teeth and implant replacement would be equally foolish, or brave. This patient has already suffered severely following dental treatment. 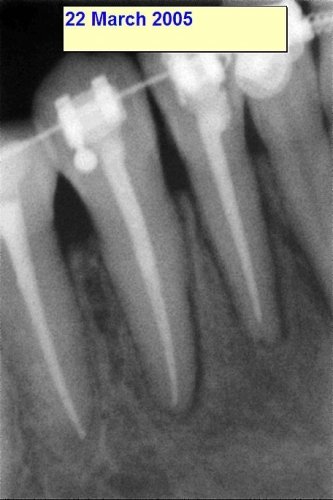 To run the risk of even the slightest complications following endodontic or implant treatment is almost unthinkable. There is real irony in Case 7, where several reasonably acceptable root canal treatments had to be redone and even followed by apical surgery and in one instance an extraction while two teeth with below standard root canal treatments remained stable, albeit associated with swollen pain free lymph glands. This patient’s mouth and body simply would not tolerate endodontic procedures well. What is going to happen when eventually the two teeth with “poor” root canal treatments are re-treated? Will the glands resolve and will the best root canal treatments be good enough? The fact that the patient eventually made a full recovery is a grim reminder that most often patients’ complaints and symptoms are real and should be fully investigated and treated. 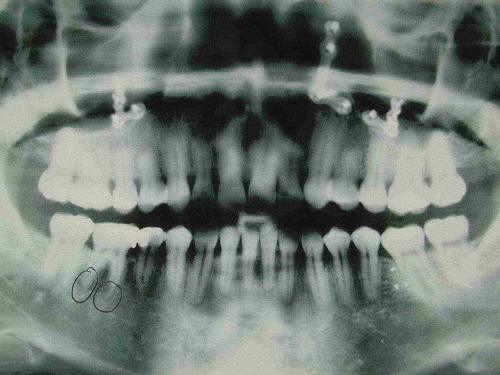 Case no 5 is the most poignant reminder of the dentist’s primary role in health care – To observe for signs of malignancy every time a mouth is examined or treated. Every dentist is obligated to look and see, every time they look inside a patient’s mouth, even if “only to recement a crown” for signs of serious disease, such as malignant tumors. This case highlights a different and very real side to the condition of chronic orofacial pain which can have very severe consequences if managed incorrectly. The endodontist’s body of knowledge about chronic facial pain is limited. Our diagnostic methods are crude and antiquated. We simply do not have at our disposal the means for accurate and reliable diagnosis. We rely heavily on the history, vitality testing, clinical and radiographic appearance. There has been no real advance, as far as diagnosis is concerned over the last 50 years. For these reasons we are often confronted with teeth where we simply don’t know whether the pulp is in fact in a state of irreversible inflammation or not. Therefore it is often impossible to state categorically “This tooth and pulp is 100% healthy and can not be the cause of chronic facial pain”. Conversely, it is only with the benefit of hindsight that we can sometimes say “Yes, our diagnosis was right and this tooth was in fact the cause of the patient’s chronic facial pain”. 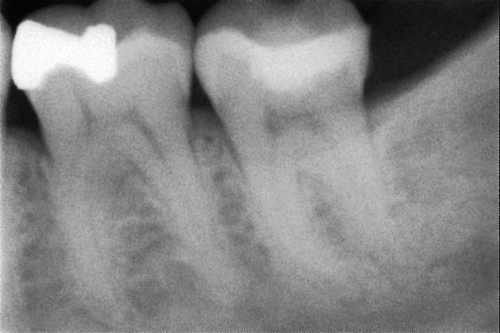 There have been several attempts to develop Laser Doppler Flowmetry for endodontic examination.7,8,9 Vitality testing with heat, cold and electric impulses only measure the sensibility or the health of the nervous tissue whereas the real and true prognosticator is the blood flow through the pulp. Pulse oximeters and Laser Doppler Flow meters should be able to measure blood flow but in teeth are impeded by bone, periodontium, dentine, enamel and restorative materials. Future research should be directed at finding solutions to these frustrating challenges. Teeth can be the cause of severe, excruciating, chronic orofacial pain but there are other causes as well. It is the endodontist’s duty to understand this, to examine every patient systematically, to be as conservative as possible when indicated, and to treat “aggressively” when indicated. This role cannot be fulfilled without a great deal of patience, empathy, skill and knowledge. Chronic orofacial pain is often a maze and the endodontist should avoid being led into it without a careful history, examination, diagnosis, treatment planning and discussion, before treatment. Even as treatment is commenced the investigative process should be continued and developed to confirm or change the diagnosis. It is obvious that the treatment of mental disorders, trigeminal neuralgia, neuropathic pain, maxillary sinusitis, cancer and many other obscure causes of chronic orofacial pain falls outside the scope of the endodontist but the majority of cases indeed has pulpal and periodontal sources of origin. These are the cases that have to be treated by the endodontist. Case 10 was a vivid reminder of the fact that even patients with a history of very serious conditions can develop “simple toothache” which can and should be treated with uncomplicated means. In the light of this patient’s history (neuralgia and brain surgery), main complaint (vague facial pain) and peculiar, delayed reaction to vitality testing, it could have been very easy for the suspicious practitioner to fall into the trap of over examination, eg unnecessary scans and pathological tests, and over treatment. In the final analysis, the real challenge then, always, is the diagnosis. Always listen to the patient. Take a detailed history and write it down. Question in detail the nature of the pain. Do a systematic and thorough examination of all tissues, including the neck, submandibular area, pharynx, tongue, cheeks and palate, the teeth, the occlusion and periodontium. Do a systematic vitality screening of all teeth in the half of the face of the main complaint. Take adequate radiographs and study them carefully. Treat, re-observe, treat again. Much can be learned from observing the patient’s reaction to treatment and by being conservative the patient can be spared unnecessary treatment. Communication with the patient is essential. Considering the shaky foundation of our diagnostic technology it is imperative that the patient be involved in the decision making process. The patient must be informed of the nature, cost, complications and side effects of root canal treatment prior to treatment. If poor root canal treatment and an associated peri-radicular radiolucency are observed the tooth can be the cause of chronic facial pain. If a large carious defect or large restoration is present, the tooth can be the cause of chronic facial pain. If resorption or impacted third molars are present, it can be the cause of chronic facial pain. All possible causes of chronic orofacial pain should be eliminated, for example by root canal treatment or extraction before complex, specialized treatment eg. orthognathic surgery is considered or indeed before the patient is classified as being neurotic. The role of the endodontist and indeed the entire dental profession in the management of these patients is to diagnose correctly, treat definitively, refer appropriately and eliminate, not create doubt. 1. Okeson JP (2005) The processing of pain at the brainstem level. In: Bell’s Orofacial pains: The clinical management of orofacial pain. 6th edition Illinois: Quintessence, 2005 : 66-104. 3. Romano JM, Turner JA, Friedman LS, et al. Sequential analysis of chronic pain behaviors and spouse responses. J of Cons and Clin Psych 1992; 60:777-782. 4. American Psychiatric Association. Diagnostic and Statistical Manual of Mental Disorders: DSM-IV, vol 4. Washington, DC: American Psychiatric Association, 1994. 7. Lee JY, Yanpiset K, Sigurdsson A, Vann WF Jr. Laser Doppler flowmetry for monitoring traumatized teeth. Dent Traumatol. 2001 Oct;17(5):231-5. 8. Evans D, Reid J, Strang R, Stirrups D. A comparison of laser Doppler flowmetry with other methods of assessing the vitality of traumatised anterior teeth. Endod Dent Traumatol. 1999 Dec;15(6):284-90. Roeykens H, Van Maele G, De Moor R, Martens L. Reliability of laser Doppler flowmetry in a 2-probe assessment of pulpal blood flow. Oral Surg Oral Med Oral Pathol Oral Radiol Endod. 1999; 87:742-748. 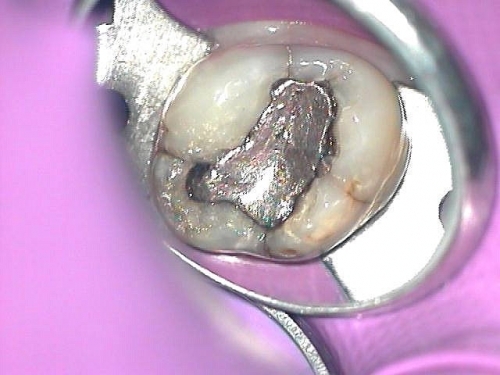 Case Report: Amalgam, the only choice that made sense. Removal of fractured file. Is it necessary? Supervised Neglect or Intelligent Monitoring? Are silver amalgam ("the infamous lead") fillings bad for my health?